We Help Lost, Hurt and Hungry Pets. Get help for your pets. The Humane Society of Morrow County (the “HSofMC”) pledges to provide as much outreach service to the community of Morrow County as possible, by providing pet food and medical services to those in need within the County. If your family is a recipient of services provided by federal, state or local agencies you may qualify for obtaining assistance for your pet from the HSofMC. Disasters such as house fire, flooding, etc. THE FOOD ASSISTANCE PANTRY PROGRAM IS BEING REVISED AND HAS BEEN SUSPENDED UNTIL 1/1/19. The food assistance pantry is designed to provide temporary assistance with pet food and other care needs. In order to receive this assistance, your family must NOT be engaged in breeding pets or in using them for illegal activities. You must agree to maintain your pets in healthy condition. Finally, you must agree to use the pet food which you are given to feed YOUR pets. You cannot sell or barter the pet food for other products. If you meet the above requirements, call us at 419-947-5791 option 4 to discuss your pet food needs. We do not always have food available. We rely strictly on donations from organizations and individuals to keep this part of our community outreach going. The HSofMC can also provide limited monetary assistance for pet medical costs which exceed the financial capabilities of low-income pet owners. You may contact us at 419-947-5791 Option 4 to inquire about this service. HSofMC PO Box 298, Mt. Gilead, OH 43338.
you will get a call to schedule the surgery. 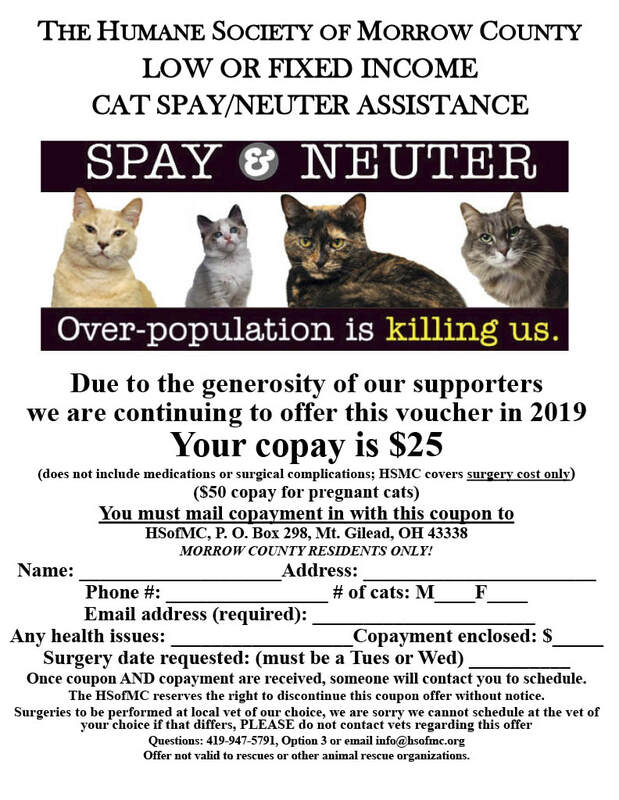 Whenever possible, the HSofMC encourages the family to make a co-payment to assist with spay/neuter charges. ​This also allows our program to continue for other people that need help in the future. 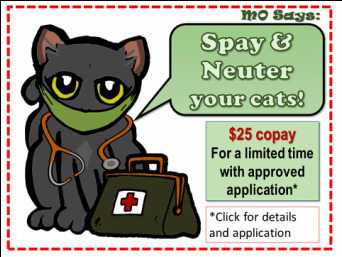 We would like to emphasize the importance of spaying and neutering to eliminate unwanted animals in the community. You may contact us at 419-947-5791 Option 4 to inquire about this service.